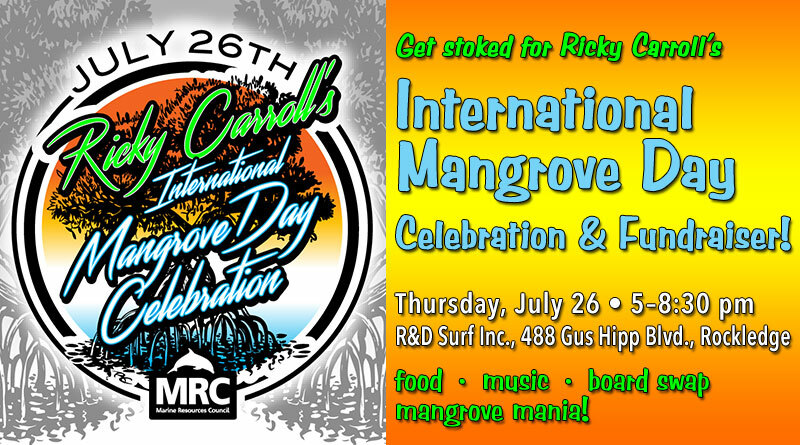 Please Join Ricky Carroll, world renowned surfboard shaper, Marine Resources Council, & Carroll Distributing Co. in celebration of International Mangrove Day, to help raise awareness and funds to save our Indian River Lagoon! • Jasmin rice w/ black beans, topped w/ homemade pineapple salsa finished w/ blackened shrimp. • Jasmin rice w/ black beans, topped w/ creamy coconut chicken, smothered w/ salsa verde and a side of fried plantains. • Lady & the Tramps. Bring your old board to sell, swap, or give away! The lagoon needs your support! Mangroves are a vital component of a healthy lagoon! Help us plant thousands of mangroves this year! When: Thursday, July 26th from 5 p.m. – 8:30 p.m.